New Magic Melts! Not actually magic, but only Magic Melts are so highly fragrant! Create welcoming scents in your home with our long lasting fragrance bars. No flame, no worries! Magic Melts Fundraiser - Not actually magic, but only Magic Melts are so highly fragrant! Magic Melts - Not actually magic, but only Magic Melts are so highly fragrant! 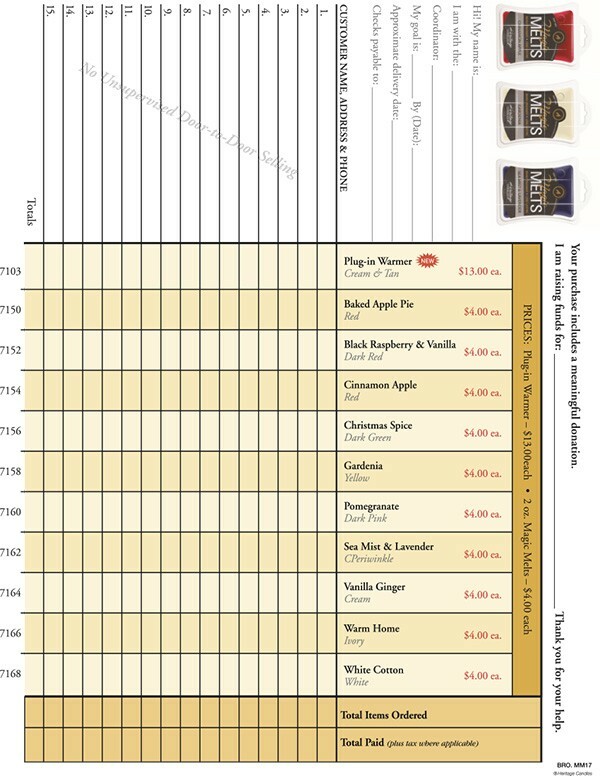 Create welcoming scents in your home with our long-lasting fragrance bars. There is no flame, so it’s extra safe! Simply break off portions of your favorite fragrance and add them to a warmer. You can use them at your home, dorm or the office. If your supporters don’t already own a warmer, they can buy one from you for only $13 each. FREE to Start: The Magic Melts fundraising program costs absolutely nothing to get started. Simply let us know how many fundraising participants are in your group, and we’ll send 1 order-taker for each of them, at no charge. Reach Your Fundraising Goal: Your group keeps 50% of everything they raise. Priced To Sell: These Magic Melts sell for only $4 each, so you’ll find your supporters will by several at a time! They make a perfect gift for yourself, a family member, friend or co-worker. Free Shipping and No Minimums: Your group receives Free Shipping when you sell $1,000 retail or more of fundraising product. Your Group Keeps 50% of Everything You Sell! How Does the Magic Melts Candle Fundraiser Work? 1. 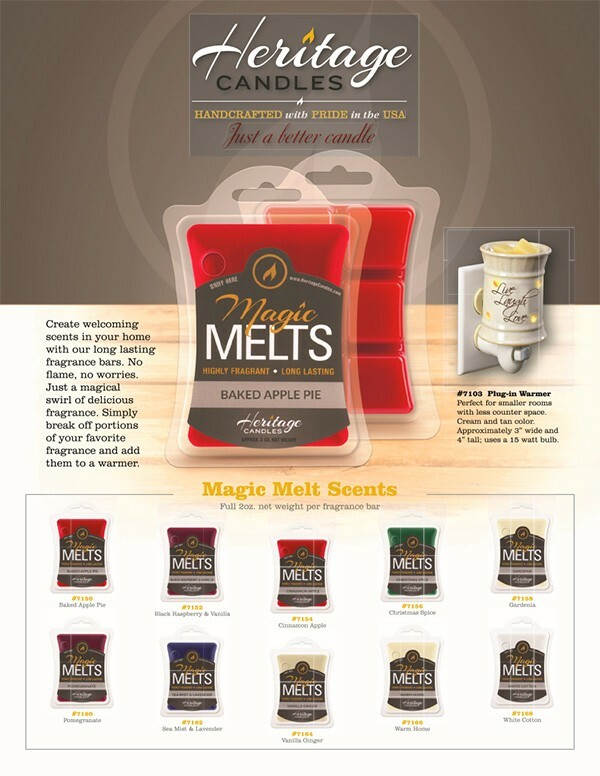 Order 1 Magic Melts Candle order-taker PER fundraising participant – they’re FREE of charge! The products are very good quality!! We are trying to raise money to buy the building we are using for our school. Our group wasnt real enthusiastic this time, but we did raise close to $500, so can't complain!!! But would definitely use just fundraising again!! Very happy with this fundraiser, great product!!! We definitely use justfundraising in the future!! The Magic Melts were a great addition to our candle fundraiser. It added a nice variety to what we were selling, and our customers were very impressed with the low prices. order was wrong but were very easy to work with to correct. Candles are strong which I love, smells up my whole house! My good friend has stage 4 cervical cancer and has been having to travel alot to Oklahoma for treatments. This fundraiser helped with airline tickets and medical expenses. Easy to get started. Fast delivery. Awesome customer service. Great return!! !